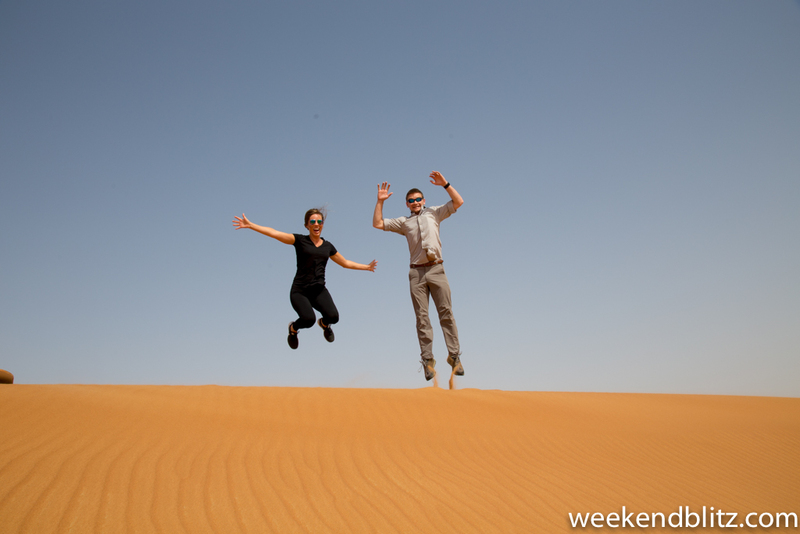 On our way to Australia, we spent our first few days in Dubai. It was my first trip to the UAE and Jeffrey’s second, and it was fun to split up our trip with a stop in Dubai- especially to get a taste of non-Western culture since our final destination of Australia was about as Western-feeling as you can get! 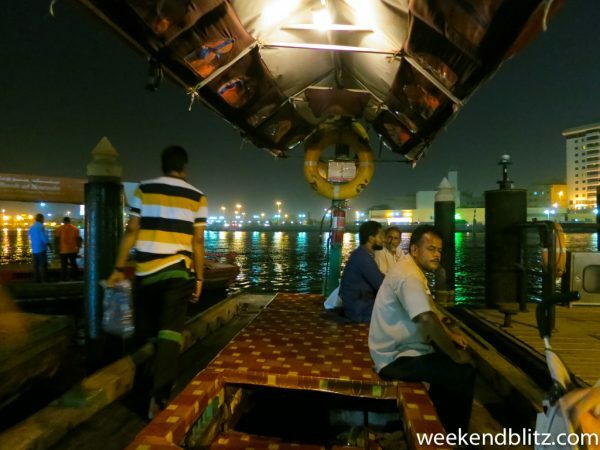 After flying Etihad Airlines into Abu Dhabi, we decided to spend our entire time in Dubai. 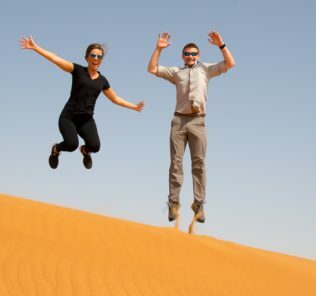 Originally, we planned to spend a day or two in both Abu Dhabi and Dubai, but ultimately decided to spend all 3 days in Dubai to get a better feel for the city and try to stop over in Abu Dhabi in the future. Looking back, we’re glad we made that decision as any shorter and our time would have felt rushed. 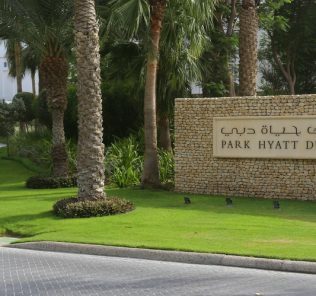 We ended up staying at the Park Hyatt Dubai (overview here), and headed into the city to explore the main sites and attractions in the stifling summer heat (with daily highs averaging at 102°F in June!). We thought we’d be able to hang since we’re used to Charleston summers, but it was so hot that we spent most of one afternoon in the mall just to escape the heat! Check out what we did during our 48 hours in the “City of Gold” below! First things first, we were up bright and early with jet lag, so we found ourselves eating breakfast at 6am at the hotel and then off to the city center (about 20 min. away) by 8am – a much earlier start than usual for us. We were dropped off right by the Deira Spice Souk first and found that the city was just beginning to wake up with pedestrians and people headed out for the day. It was fun to stroll through the spice souk and see all the brightly colored powders and spices available for sale from vendor after vendor. Although it seemed a bit touristy (and vendors were definitely hawking their wares), it was also reminiscent of days of old and you could get a glimpse of the old Dubai before all the modern high rises and shopping malls were built. From there, it’s just a short walk to the Dubai Gold Souk, which was also quite the treasure chest of jewelry and anything made of gold imaginable. 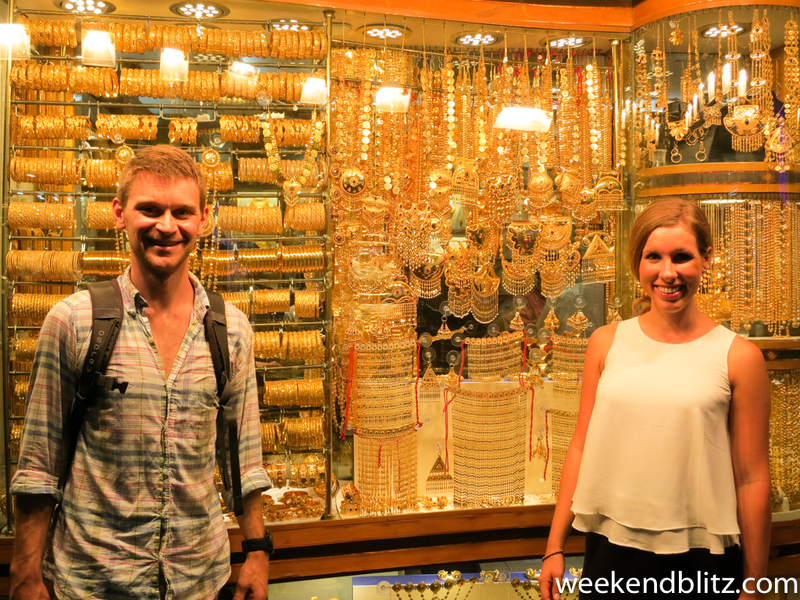 While I didn’t buy anything, it was fun to see all the gleaming gold necklaces, bracelets – some bigger and gaudier than I’d ever seen before! I really thought these must all be fake because they are so fabulous that I cannot even imagine the price tag on these jewels. Yikers. 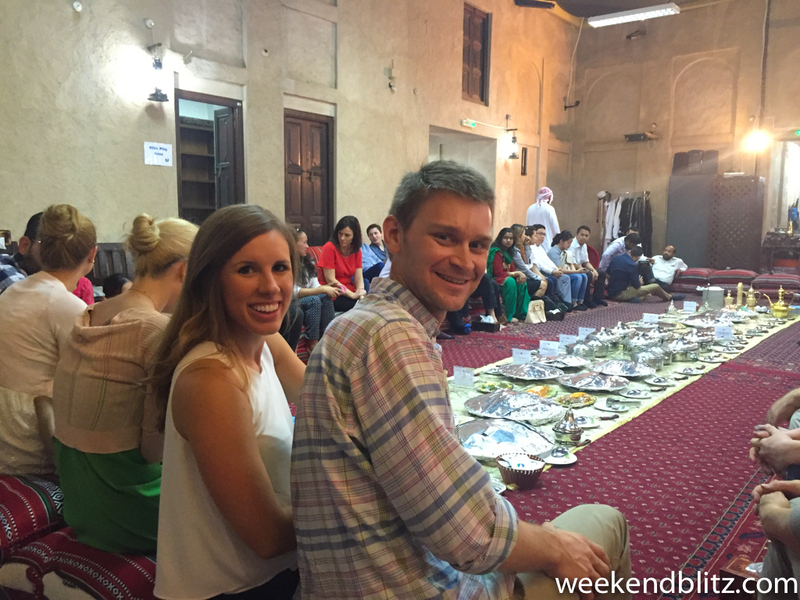 While the souks were definitely a must-see, we didn’t feel the need to purchase any spices or gold and these stops were just more to say you’ve seen them. Although it is definitely a tourist destination now, there are still signs of local life if you look hard enough. The souks are even more interesting when you learn a little of how Dubai quickly transformed from a small fishing village to one of the world’s most bustling cities. 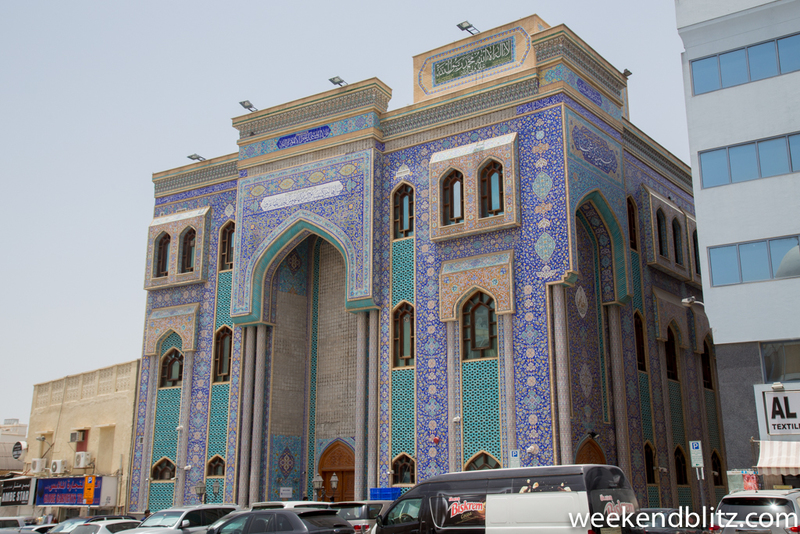 From the souks, we crossed Dubai Creek via a ferry and began exploring the area known as “Bur Dubai.” We stumbled upon the Ali bin Abi Talib Mosque because we noticed everyone walking there for prayer. 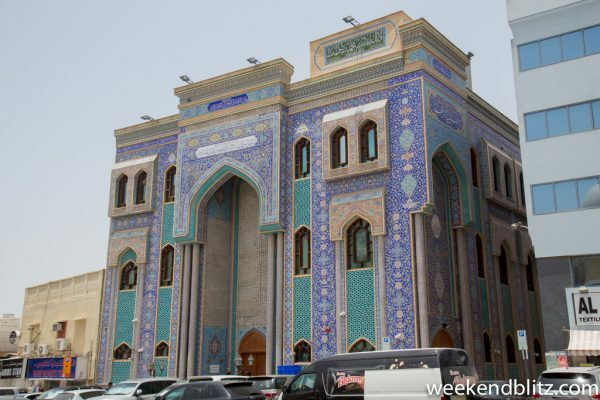 I think it may be the most beautiful mosque I’ve ever seen in real life – the blue tile with turquoise accents stands out among the bleak off-white buildings surrounding it. 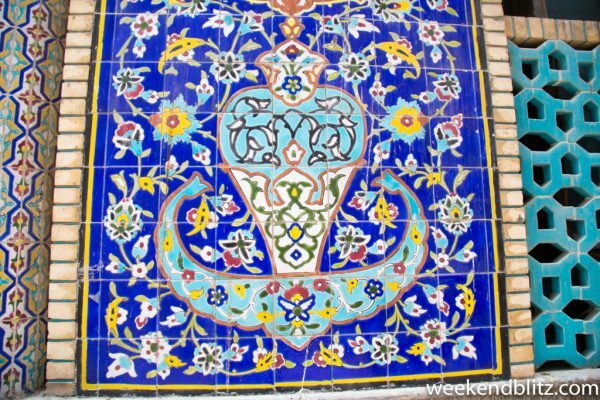 We did not go inside out of respect for the daily prayer time but just stood outside in awe of the building’s intricate beauty. 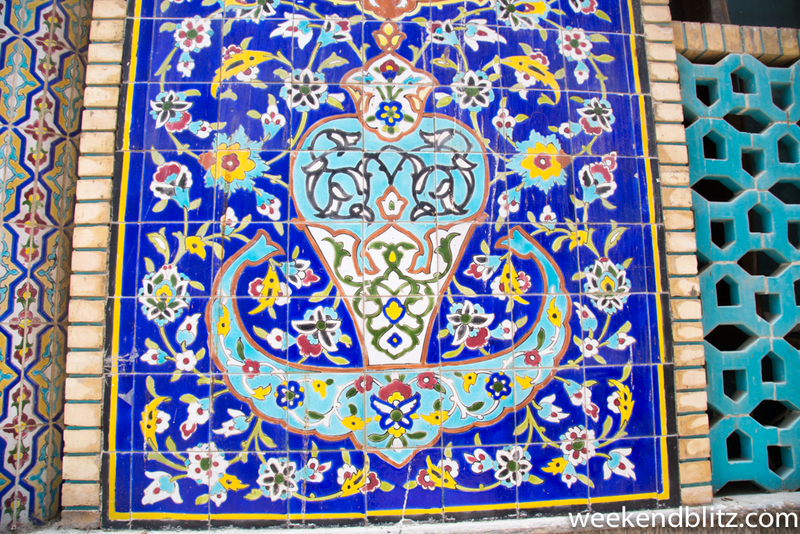 From the mosque, we continued aimlessly walking (and stopping under any shade we could find! 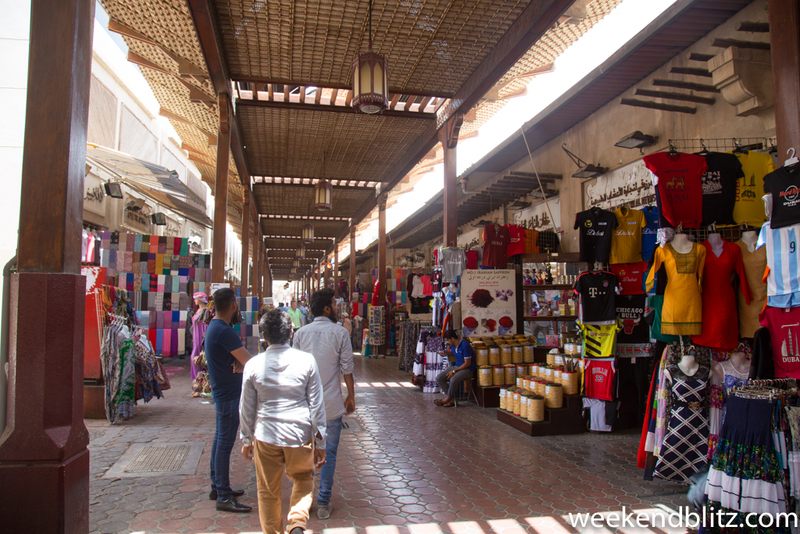 ), and walked through the Bur Dubai Souk, which has plenty of textiles and souvenirs for sale. 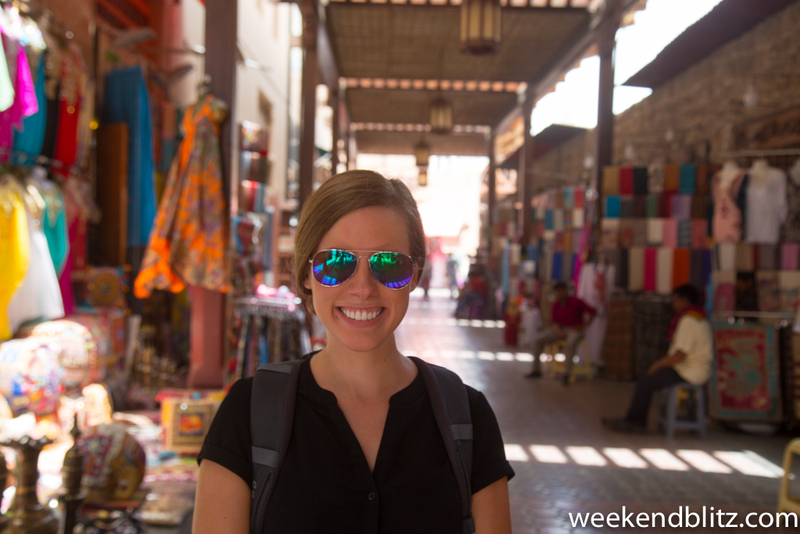 There was plenty of activity but we didn’t buy anything at this souk, either – we’re always a bit put off by the sellers hawking their goods so heavily that we feel uncomfortable just looking. 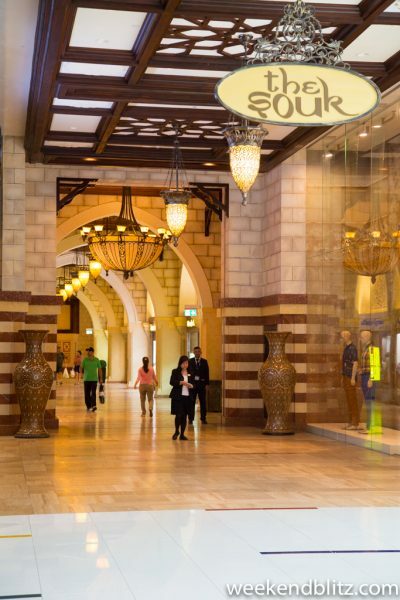 Feeling a bit “souked-out,” and very, very, very hot, we determined it was a good time to head to the world’s largest mall, creatively called “The Dubai Mall.” Although the mall is huge, I honestly wasn’t too impressed with it because it just feels like… a mall. 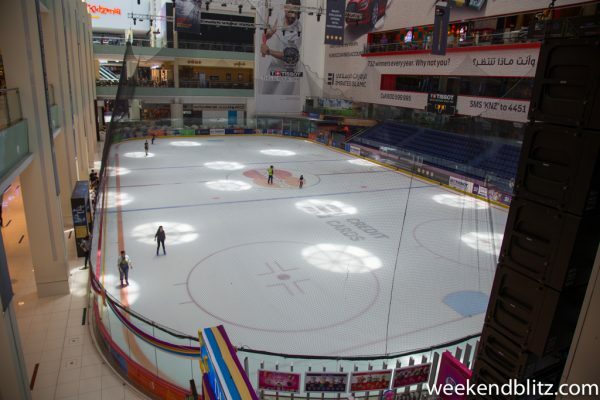 Other than its sheer size and that it keeps going and going with what feels like miles of stores, I guess there’s not much you can do to make a mall not feel like a mall. 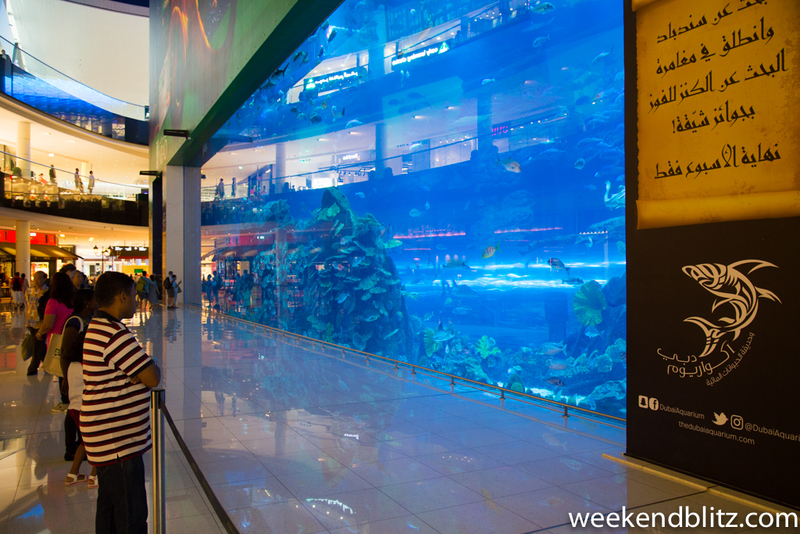 There is a 3-story aquarium, but otherwise, it was just your average mall. We typically would not have spent much time here, but I think we walked every inch of the place just to enjoy the air conditioning and while away the early afternoon hours when the sun it at its peak. Of course, being the world’s largest mall, they had an equally proportionate food court. However, because we were visiting Dubai during the month of Ramadan, many of the restaurants in the city were closed during daylight hours. Interestingly, the mall’s food court remained open but they had set up partitions at the food court’s entrances to block people from seeing in. 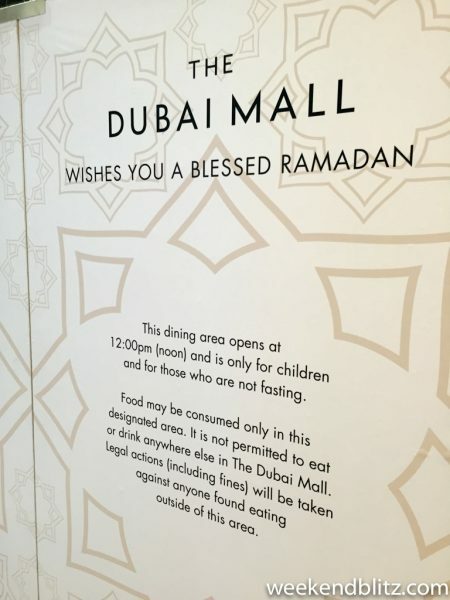 Signs at the food court stated that there could be fines for taking food outside into the mall, and there were even guards stationed there so that anyone leaving the food court would not be able to bring any food or drink into the mall. 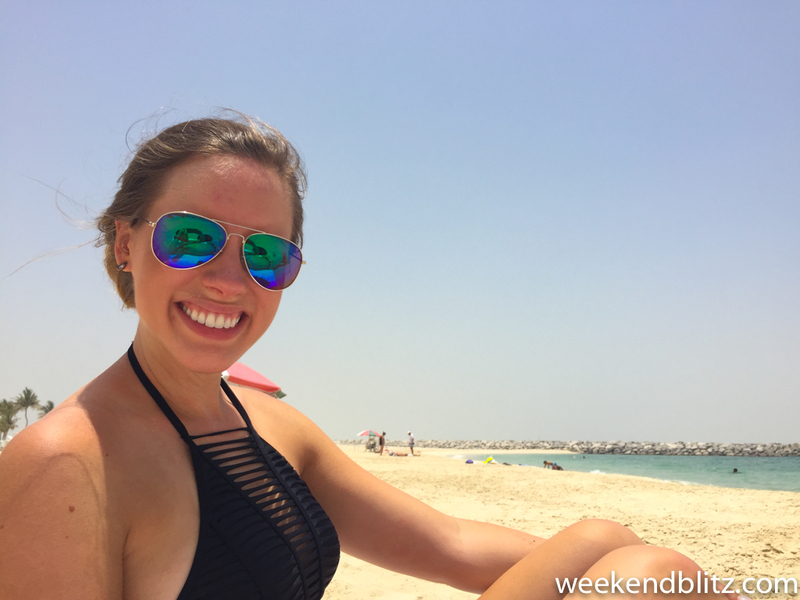 It was really an interesting time of year to visit Dubai! The Burj Kalafi, the world’s tallest building, is easily viewed from the outside of the mall, so we built up our courage and finally left the AC to at least take a photo with the Burj Kalafi in the background. We were so hot and the sun was so strong that we literally took the fastest picture we could and walked back in the mall. Sad, but true. 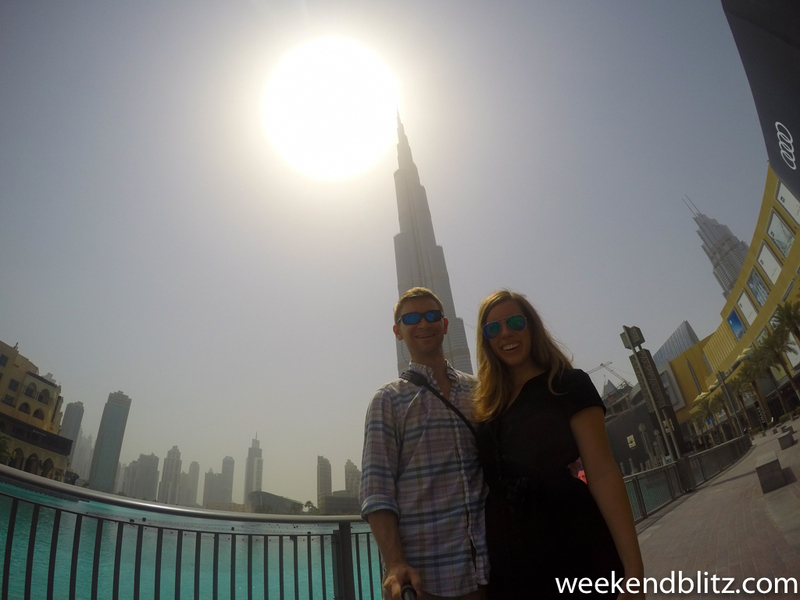 Standing in front of the world’s tallest building! We actually booked our reservations for the dinner through Urban Adventures (a tour company we’d used a lot in Vietnam) and, when we arrived, were met with a local tour guide, Mohammed, who hosted just the two of us. While we could have just booked reservations straight through the Center, we were happy to have our own guide to eat with us and explain even more in depth about the holiday, the city and the traditions. An appetizer of the most delicious dates! It turned out that our guide, Mohammed, is Pakistani. 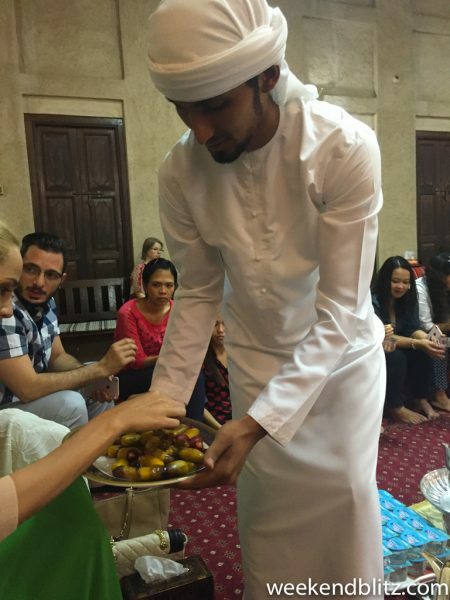 He said that his grandparents came 45 years ago to Dubai and his family has been there ever since; he was born in Dubai but still is not a citizen. Citizenship is only for the “people from this land.” He said that even tour guides who were born here must apply for work permits every 2-3 years. Looking back, this is probably our favorite thing from our trip to Dubai. 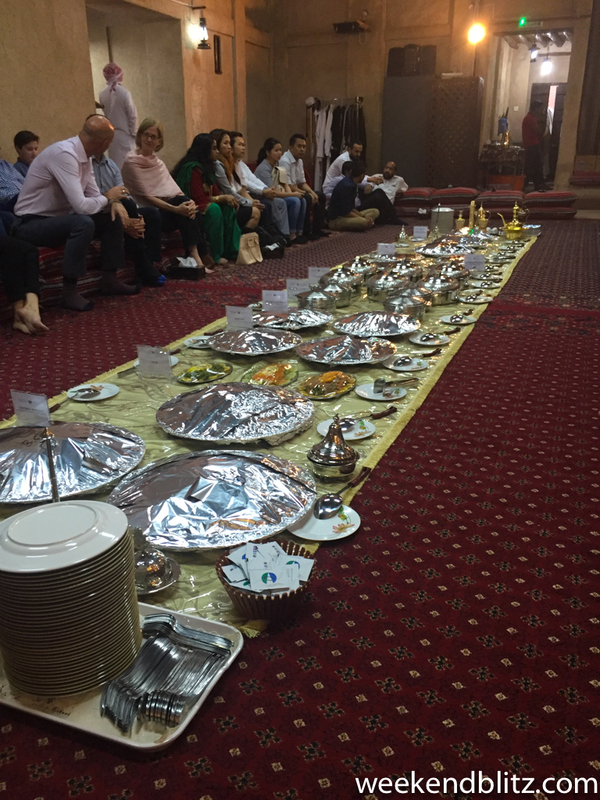 We weren’t eating with a family, but the group that hosted the dinner for tourists were really interesting in sharing their culture with us and teaching us more about the region. 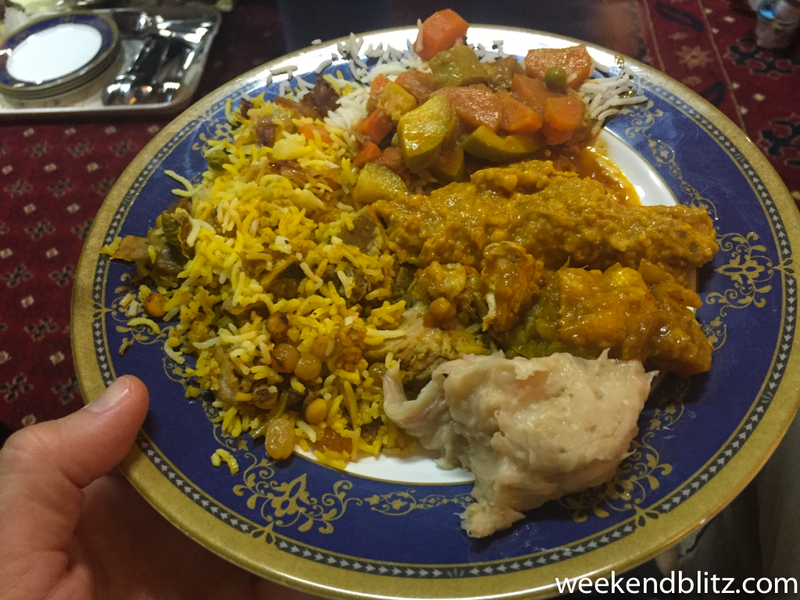 The food they prepared was homemade and so delicious – you could tell that the families who hosted us were eager to befriend us and share with us a little about their holiday. At the dinner, they explained to the group about the holiday and the traditional foods eaten during the evening hours. 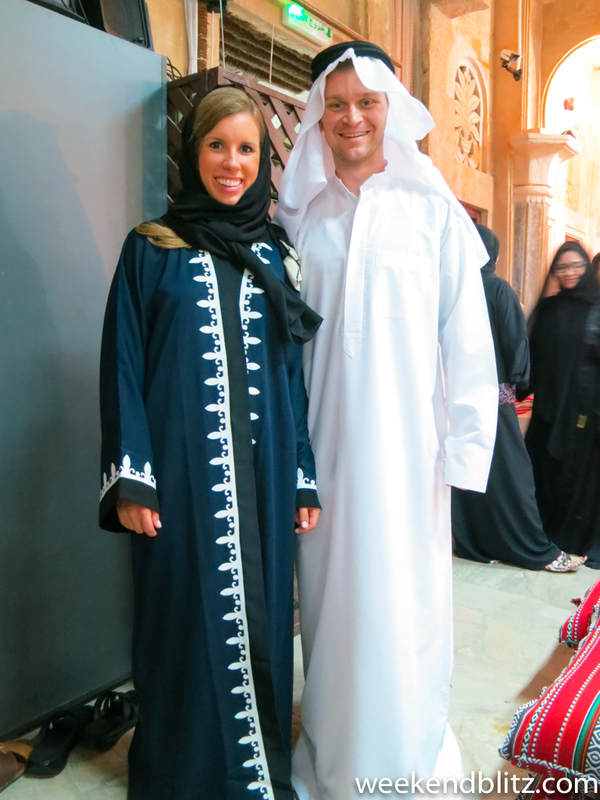 After dinner, we were taken to visit the inside of a mosque and then encouraged to try on traditional Emirati attire. It was truly a night to remember. Dressed in traditional Emirati attire! After dinner, Mohammed took us around the city for a quick walk through some of the highlights. We were able to hop on another ferry to cross the Creek again. The ferries, similar to the souk, tell of a time passed. 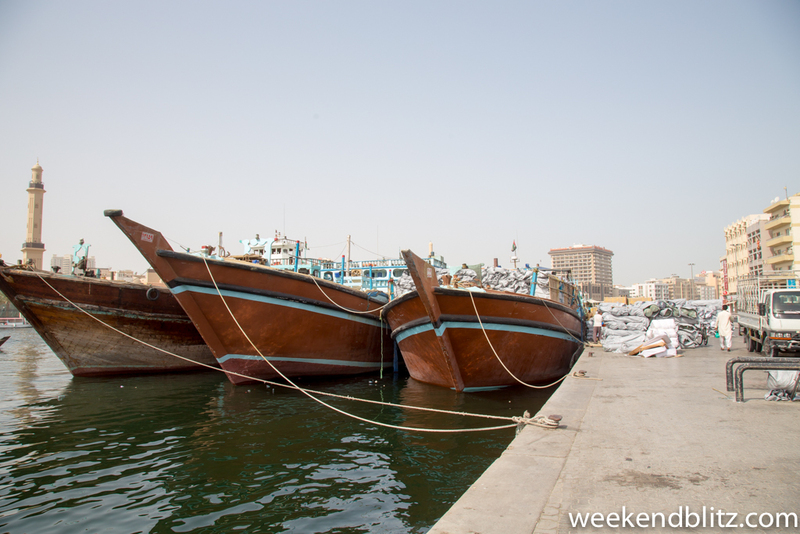 The locals hop on the old wooden boats to churn across the water in just a few quick minutes. 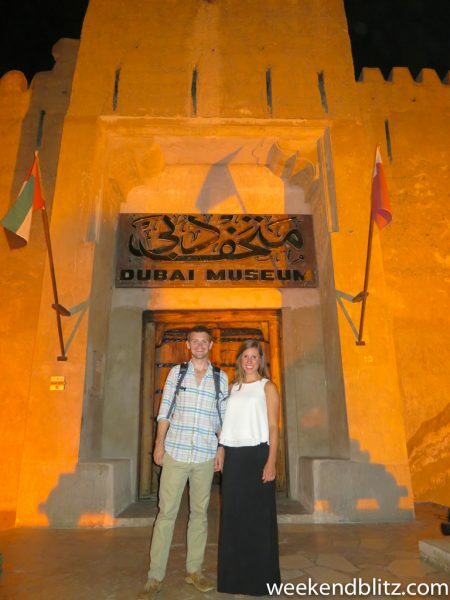 More details on this in a follow-up post… but, this is a must-do activity when you’re visiting Dubai! The surrounding desert seems to be right out of a movie and is a terrain that is so different than one I’ve seen before- even so different than the desert around the Grand Canyon in Arizona. It is a beautiful, other-worldly terrain and an adventure not to be missed! 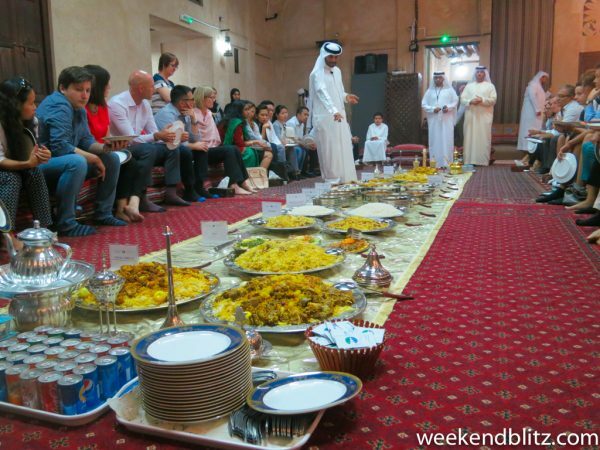 We’d heard a lot about weekend brunch parties in Dubai and that they are over the top in every way. Unfortunately, though, they cease to exist during Ramadan, so we weren’t able to enjoy one. Instead, we decided to see what the beach was like and took an Uber to Al Mamzar Beach Park. 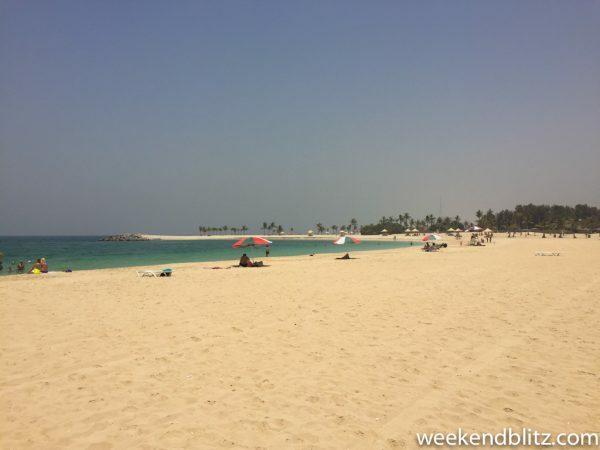 There were a few options, including the nice resort beaches (like Habtoor Grand Beach Resort & Spa and Sheraton Jumeirah Beach Club), but those are only free to hotel guests and others have to pay pretty hefty day-trip fees (some are up to 550 AED/person– ~$Open Currency Converter Error: Could not fetch exchange rate information US). If you’re really into the beach, it’s worth considering staying along the Jumeirah stretch at a hotel on the beach. 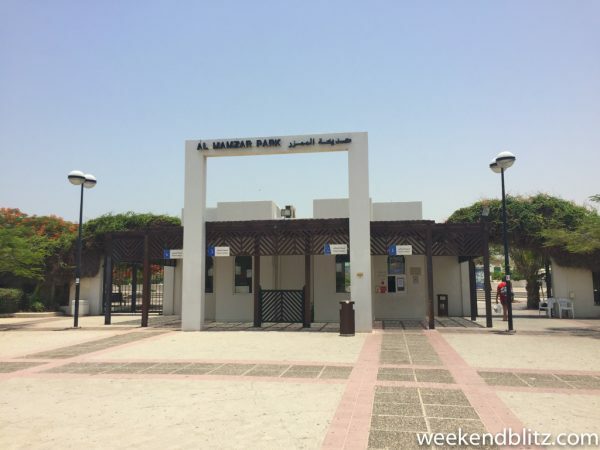 However, we weighed the pros and cons and decided we didn’t have to stay at a resort on the beach and instead just went to one of the public beaches for a small fee (5 AED/person– ~$Open Currency Converter Error: Could not fetch exchange rate information US). Unfortunately, we didn’t fully think through riding in the Uber to get to the beach and ended up wearing our swimsuits under regular clothes. After walking from where we were dropped off through the park to the beach, we were already exhausted and sweaty. The beach was nice, but nothing too special and we decided after a little while that we were really feeling our hotel’s pool scene more than the public beach. 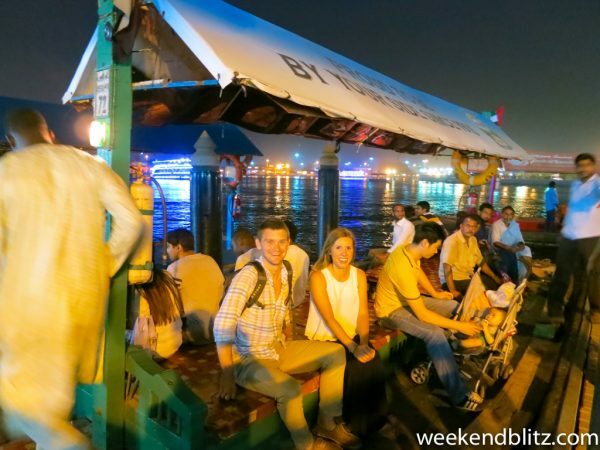 BOTTOM LINE: We found Dubai to be a huge, bustling city that still clings to a culture of its own. We enjoyed our time there (despite the heat). The people were so friendly and it was intriguing to see the celebration of Ramadan throughout the city. 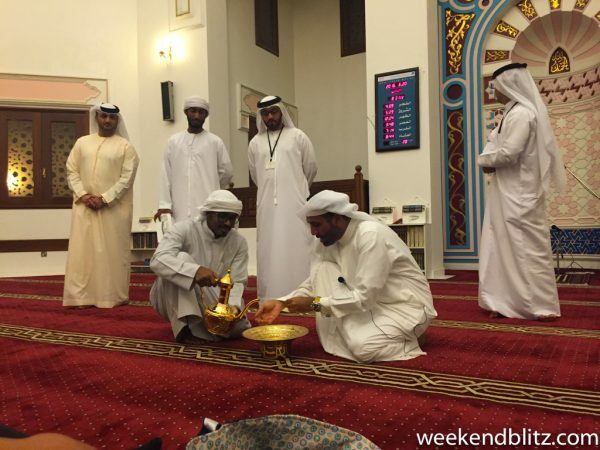 I’d love to visit again, but next time probably spend some more time in Abu Dhabi or another area of the UAE.